I got a blog award! Red Nomad Oz was kind enough to think of me when handing out the Sunshine Award. 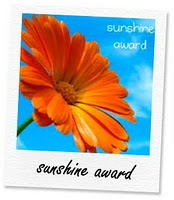 This award is given to "those whose positivity and creativity inspires others on the blogosphere." Thanks Red! Red travels Australia, providing commentary and photos of the stunning landscape. So when you need to see some beautiful photos and read some funniness, go check her out! A) Thank the person who gave this award. B) Answer the following questions below. C) Pass the award on to 10 fabulous bloggers, link their blogs and let them know you awarded them. This question has come up before and my answer was grey. Nope. Just kidding. Still grey. Aside from my pup, I'd say giant pandas. I got a stuffed toy when I was 5 and the love affair began. Just like my friend Red. I can't help but wonder if this has any bearing on my general good fortune. 5. Facebook or Twitter? I've become quite the Twitter fiend, but I'm also always on Facebook when I'm online. 6. Your passion? Well I'm Canadian so "passion" is kind of a strong term. I do love to run and to draw. Though I think we can all agree I should never do both at the same time...especially when running down a hill as I seem to be doing in this picture. 7. Giving or getting presents? I love finding the perfect gift for someone. But let's be real, who doesn't love getting presents?? So, that said, my favourite day is SATURDAY! And now, for the 10 bloggers to whom I shall pass this on (no pressure to post the award, but these are fun reads for me). Mayor Gia She's funny, sarcastic, does drawings, and is definitely for the not-offended-by-language crowd. Cranface He is funny, sarcastic, does drawings, and is definitely for the not-offended-by-language crowd. (You really can't have Cranface without Gia, and vice versa). Pickleope Witty, bizarre, brilliant. With drawings. One Mixed Bag Bernie has a big heart, rivaled only by her big sense of humour. I love her Wordless Wednesdays. Watch Me Go Run Her signature 'cheeseball' grin lets you know that while she's serious about running, she doesn't take herself too seriously. B for Bel Bel finds some of the coolest and most fun things on the net. The Athletarian She's a runner, a vegetarian, and promotes health without being preachy. This Spartan Will! She will be racing Ironman Arizona this year. That's inspiring. On the Road Again Megan About to have a baby, ready to run again. I can relate to the ready-to-run-again part. TexaGermaFinlaNadian Moving to different countries every hockey season, I live vicariously through her. If you saw some repeats up there from previous award posts, it's because these are the sites that draw me in with every new post. I now have a serious request: I know a lot of you have started hosting your own domain. Can you please share with me the benefits (and frustrations) of doing this? Thanks!